This is actually a really tall order. For years, raw honey has been my go-to recommendation for skin cleansing. It’s got the right PH, it’s gentle and non-stripping, obviously free of harsh chemicals, and has healing nutrients for the skin. It rinses off freely too. 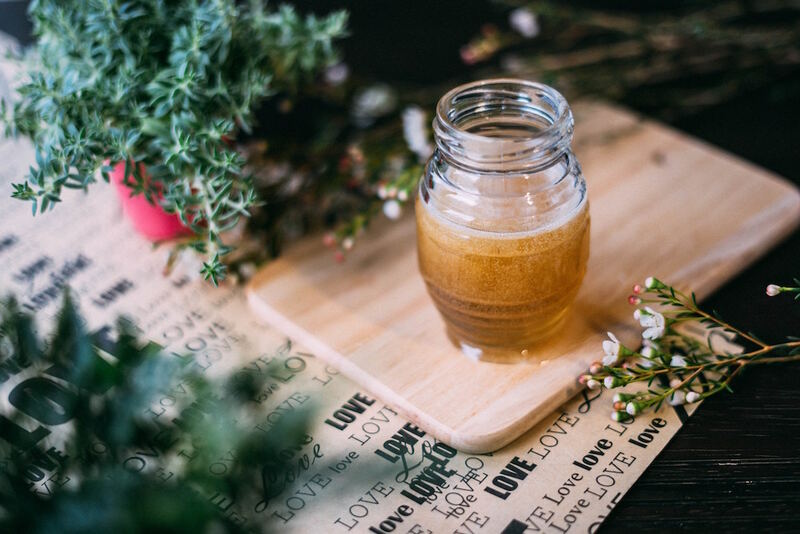 While it works wonderfully for many people who agree it has greatly improved their skin, the enzymes in it can be a little too much for some people if your skin is super sensitive (more so if it’s a stronger honey like manuka). It can make your bathroom counter all sticky, and it’s also not the most convenient thing to pack around if you’re traveling or staying over somewhere. But also it just doesn’t always do the best job at fully removing makeup, especially if you use thick, full coverage. So then people have to add in a ton of extra oils, exfoliation, or chemical makeup removers just to get their makeup off. 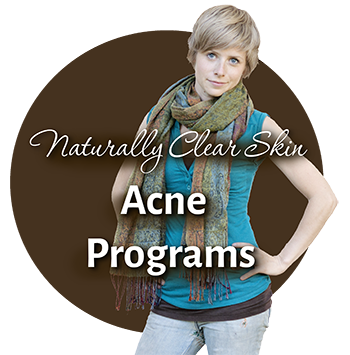 And honestly, the simpler the better when it comes to healing your skin from acne. 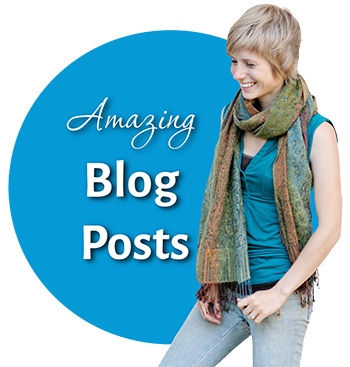 Contrary to what you think will kill acne (the stronger the better! More products! More products! More products! )— the more complicated your routine is, the more products and ingredients and elbow grease you have to put into it, the more likely it is to contribute to acne breakouts. Repeat after me: Simple. Gentle. Non-stripping. As few products as possible. So I really wanted to find something natural with the right PH that would remove makeup, cleanse, tone, not strip the skin, and just be convenient — all in one product. Micellar water may just be that! So what is Micellar Water and Why Does my Acne Prone Skin Care? Micellar water is soft water with some sciencey thing called micelles suspended in it (“an aggregate of molecules in a colloidal solution, such as those formed by detergents” … so… you know, whatever that means). Whatever micelles really are, what we care about is that they attract dirt and oil to them without stripping your skin. How Do I Use Micellar Water to Cleanse my Acne Prone Skin? It is a liquidy product, so you want to just squirt some onto a cotton pad and then gently swipe it all over your face. As needed, keep adding more micellar water to the pad (and/or rinsing it under the tap) and running over your face and eyes until your face is clear of makeup. It shouldn’t take too much to do it. Now here’s where my opinion differs slightly to the micellar water instructions. Micellar water claims that it’s a cleanser that does not involve water. Ie. you don’t have to rinse it off after you’re done. To me, it seems kind of weird as to why you would bother to lift up all this dirt and makeup, and then just essentially leave all the residue on your face. So I highly recommend just a quick splash or two after you’re done to get rid of that. Some people will probably break out if they skip this step. If your water supply isn’t so bangin’, then you may want to use filtered or spring water just for this part. And then you’re done. Makeup removed, cleansed, toned, all in one go. Proceed to moisturizing. Which Micellar Water is Best for Acne Prone Skin? Micellar water is not a “natural” product in itself (which is another reason I recommend rinsing it off after and not just leaving it on). In fact, most micellar waters (popular ones like Garnier) are full of typical skin-damaging chemicals. Completely clean, natural micellar waters are very few and far between. There is one that is more widely available, which is very close to making the mark (enough to let it slide in light of all its good qualities). 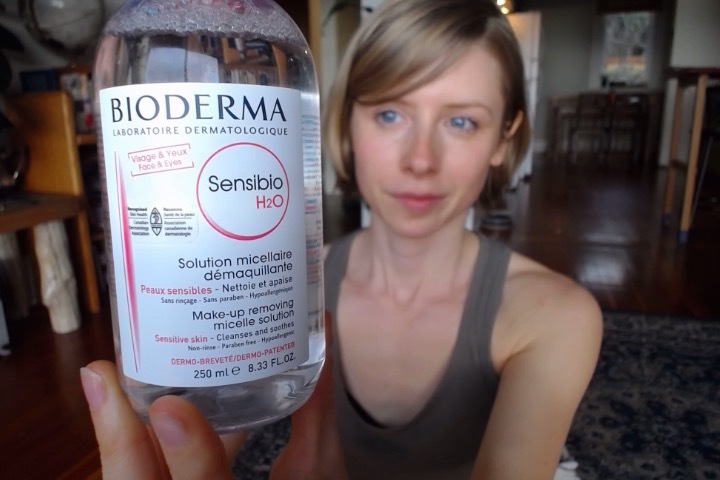 It’s called Bioderma H20 Sensibio Micellar Water (<– Amazon.com link). In Canada you can get it at Shopper’s Drug Mart. In the UK, you can get it at Boots. Looks like it’s available in Australia too, and the rest of Europe (it’s from France). So, while I used to use honey, nowadays I don’t wash my face with anything other than water 99% of the time. I’m grateful to have healthy skin now, so no need for full makeup, and I don’t live in a dirty city. So I just splash with water twice a day and then moisturize (a humectant combination of aloe and glycerin, followed by a drop of an oil mixture to lock the moisture in, all applied while skin is still wet) and that’s it. It’s super simple and this keeps my skin very balanced without stripping it or making it feel tight. However, I find that when I do wear makeup on the rare occasion, no matter what I do to get it off, leaves my skin feeling tight. That’s whether it’s using a natural foaming cleanser, or oil cleansing, it doesn’t matter. My skin basically feels tight if you look at it wrong. I did buy some of the Bioderma Micellar Water and slathered my face in thick foundation so I could test it out and see how it performed. True to its word, it took off all the makeup easily AND my skin did not feel stripped at all. It felt nice and hydrated when I was done (even before moisturizing). So it gets a big gold star from me!! Have you tried micellar water yet to cleanse your acne prone skin? Get one of those more natural options (and rinse it off at the end) and I think it’s pretty darn cool. How to Remove Makeup Gently and Naturally What Can You Use for A Natural Makeup Remover? 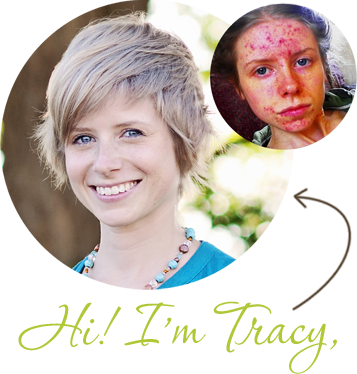 How to Remove Makeup without Cleansers, Oils, or Makeup Remover Should You Be Wearing Makeup While You Heal Your Acne? I agree with what you said : even it is said “no need to rinse”, you always have to rinse a cleaner. 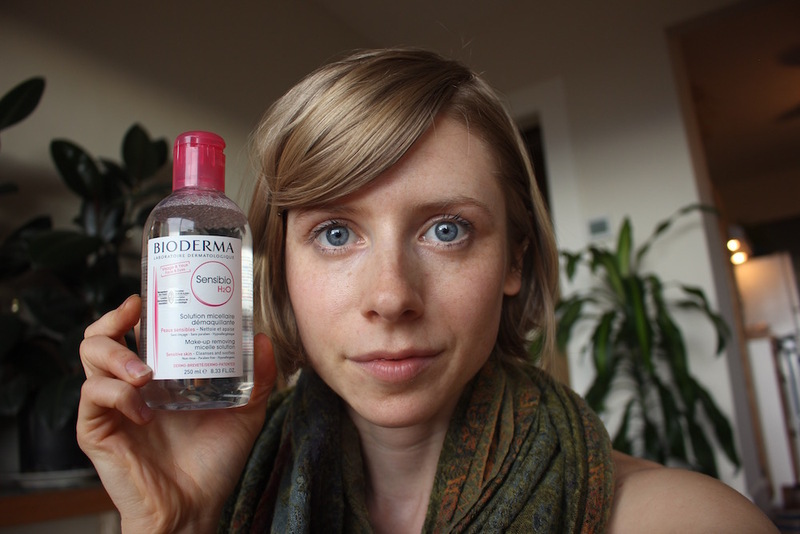 Actually, long time ago, a dermatologist recommended me this micellar water (Bioderma one, very popular in France. I’m french, by the way 😉 ) and she said to ALWAYS rinse it, no matter what it says on the bottle. She also said that this lotion is great for every type of skin : normal, dry, greasy, sensitiv, etc. I don’t know in Canada, but in France Bioderma has a lot of micellar water : for greasy acne prone skin, for normal skin, for dry and sensitiv skin, for baby skin, for dehydrated skin, etc. According to my dermatologist, the one for sensitiv skin (whitout perfume) is actually the best for ALL skin. At this time, I was consulting her for acne, and she adviced me not to choose the one specially formulated for that. She recommended the pink one, for sensitiv skin. Hi Julie! Thanks for adding your experience! I don’t remember seeing more types than this one when I picked this up at the store, but that’s a good point, and I agree with you completely — even if you don’t have acne or sensitive skin (or you just have a different skin type), there is no need to use anything but the simplest, gentlest products for sensitive skin that have the fewest chemicals. It’s much healthier for everyone’s skin! And yes, often stuff formulated specifically for acne is definitely way too strong — it’s usually really drying because people think that to stop acne you have to strip your face of all oil until it’s squeaky and uncomfortable. Noooooo. I recently purchased your wonderful eBook and have taken some skincare routine tips from it and your others blogs! I have dry, acne-prone skin and now use Manuka honey as a cleanser and I moisturize with your DIY moisturizer but instead I use hemp seed oil and sunflower oil. After years of using chemically-filled cleansers, toners, and moisturizers and now switching to this routine, my skin has been very bad lately and I am starting to lose hope. I feel like I have put my skin into some sort of shock by using the Manuka honey (although I have used Manuka honey in the past for regular face masks) and also using the DIY moisturizer because my skin isn’t used to it at all. Should I keep using the Manuka honey and instead of using the DIY moisturizer should I use 50/50 sunflower oil and aloe? I am unsure if I should keep using hemp oil because it is more targeted towards those with oily skin and I have dry skin. Or should I use micellar water? All of these tips are very helpful but I don’t want to stress my skin out too much. If you are coming straight off chemical everything and your skin is very sensitive and shell shocked, I wouldn’t expect everything to go perfectly smoothly when switching to natural… as your skin re-learns how to properly function it can go through some weird phases, and also start lifting up the junk and clogs in the pores (what it’s supposed to do to make room in future for healthy clog-free skin). So it can be a rollercoaster for sure! starting to healthier you can add more things in for more nourishment. Suddenly, I have developed these little skin-colored bumps on my forehead that have been quite itchy. From doing some research, I think it is due to folliculitis. It is when there is inflammation in the skin due to a fungal or yeast infection. I know, sounds gross right? It doesn’t look gross, it just looks like typical acne, but it’s skin-colored and there are a bunch of them! There were suggestions about using Nizoral on the face to treat it because it contains the main ingredient, ketoconazole, to eat away at the fungus. After talking with my naturopath, I wanted to stop using all skincare products and makeup on my skin and just rinse my face with lukewarm water for 30 days. I am unsure whether to use the Nizoral on my forehead because I am scared that if I just leave my face alone, it will get worse! It is also known that the fungus thrive off oil, so I wouldn’t be able to put any oils on my forehead. Try out what I recommended! And if you’d like to deconstruct a little more, please check the Academy 🙂 Thanks! First time reader. I’ve struggled with acne for years but I have to admit I haven’t tried honey. In avoiding sugars I never though about sweet honey! I haven’t tried micelar water either, but I will give it a go. Thank you. Heh, thanks for saying this, I’ve also been wondering this forever! The idea to leaving all this garbage on the face feels very yucky. Maybe it’s just a marketing trick, that everything should be so fast and easy, “one step”. These ones I’ve cited are definitely better than the Garnier one, but the Garnier one still isn’t the worst product.. if you used that and rinsed your face after, it would still be much better than using a face wash that has all those chemicals and more AND strips your skin and dries it out. I don’t know anything about the Bulgarian rose brand but as mentioned, I’m sure it’s much better than a typical face wash! Seems to remove make up well, no blocked pores, does not irritate skin, I like it! Hi Elina! It doesn’t look any worse than the Bioderma one. Rinse it off after and it should be fine! I have found some natural micellar waters by Madara, Inika and Evolve beauty (UK brand). There are more around these days. They work well, but I still prefer just water to wash most of the time. Great article! Thanks for sharing your experience. I have a question about the aloe vera and glycerin combination. Would you recommend making a blend of the two ahead of time in a separate container? If so, could you relay how much of each I would need in to make a 10 percent dilution? Or do you just wing it? Can you DIY micellar water? I read that it’s essentially oil in water. Good question! I’ve seen some DIY micellar water recipes but haven’t tested it out yet, and I have no idea if they are actually the same thing or not or if they work just as well. I’ll have to give it a try! To keep your micellar use a little more eco-friendly look into getting re-usable, washable cotton rounds. There are some nice hand made ones available on Etsy and the internet. Conventional cotton is one of the dirtiest crops there is using more harmful chemical insecticides than any other crop. This is detrimental to the health of the farm workers and people living in communities where cotton is grown. Not to mention the chemical runoff that finds its way into streams and other animal habitat. If you do choose to buy disposable cotton rounds, please choose organic. I have another question to ask you! I was so intrigued by micellar water and all of it’s amazing reviews, so I bought it myself! I purchased it from InVitamin and I just received it a few days ago. I don’t wear any makeup at all anymore and don’t use a moisturizer because I truly don’t feel like I need to (also, whatever moisturizer I do use whether it be a cream or a lotion, it makes me breakout like crazy!). If I ever do use makeup, I will be sure to take it off with this. But the real question is, since I haven’t been wearing makeup, should I use this to cleanse at night? For the past few weeks i’ve only been washing my face with lukewarm water and thats it. I still get whiteheads but my breakouts haven’t been as bad lately. What is your opinion on that? Hi Romy! Well I don’t really wear much in the way of makeup, and I just moisturize without specifically cleansing (except splashing with water to get my face wet and ready to apply moisturizer). I personally would only use micellar water if I were wearing makeup. But that’s me — if you have large open pores, live in a dirty city, or wear makeup, I’d cleanse with this at night, but not in the morning. Everyone is a bit different. If just washing with lukewarm water has been working well for you then I wouldn’t bother to use micellar water unless you were wearing makeup that day! Do you know any good moisturizers that don’t contain oil (especially coconut oil, I breakout from that) because ever since I had that “yeast” in my forehead (little skin-colored bumps), every time I leave an oil on my face they seem to get worse. Hi Romy, is it sebbhorheic dermatitis? If so, sometimes oils makes that worse because the yeast feed on the oil.. however, I have found that capric/caprylic triglycerides (or fractionated coconut oil) is the best oil to use for this. You may feel a bit concerned considering this is derived from coconut, but it’s coconut oil that has had it’s long chain fatty acids removed… the long chain fatty acids are what make it comedogenic. But apparently yeast won’t feed on oils with only short chain fatty acids and capric/caprylic triglycerides is one of the only ones. So this is what I would recommend! Also, apply oil to a wet face, never to a dry face. I don’t think Borax is something I would put on my skin so I was wondering if you had heard of cold cream cleansing and know of a good brand. 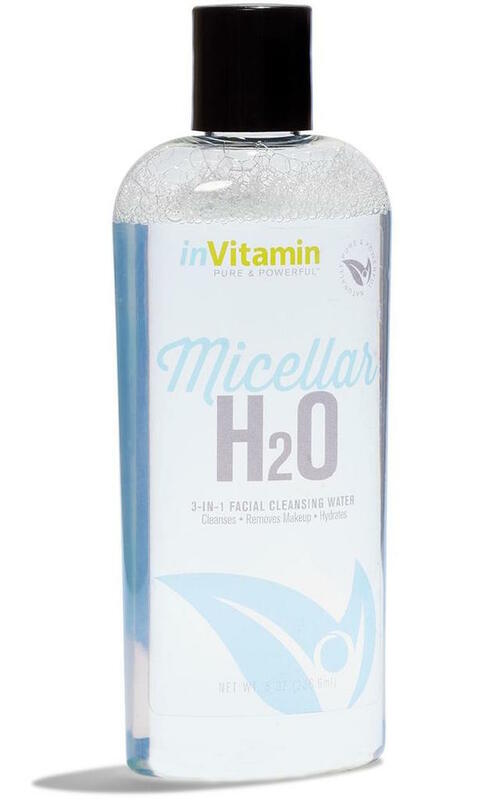 Otherwise, love the InVitamin micellar water, thanks for the review on this! Hi – did you test the ph level of these waters, or is it listed somewhere? I can’t find the info on Amazon. Maybe I’m missing something? Yes, I actually have Ph strips that I dip into things to test. It’s not usually info that’s easy to find! Micellar water is also nice if your skin reacts badly to your tap water! I’ve had good skin for a few years now, but still struggle on occasion if I move, travel, etc. My skin does NOT like all tap water equally. The harder it is, the more my skin bothers me. I did some digging and apparently micellar water was invented to help with skincare in Paris, where the water is notoriously hard and was irritating people’s faces. Thought that was cool! That’s great that micellar has helped you! I do recommend rinsing it off, generally, but if not washing it off is working ok and even better for you then great. The InVitamin one has pretty good ingredients.